This week-end we got the house back in order after our vacation and got back to the tasks involved with homesteading. We've been waiting for the Saskatoons to get ripe for a few weeks now and this week-end we harvested a pile of them. I'm not too crazy about the taste but Erich and the girls like them...the girls like them a lot. G. loves to pick berries...I do too...it kind of feels like winning the lottery when you move a leaf and find a big cluster of ripe ones. Erich was borrowing a weed whacker from Wally so G. went with him to their place with berry bucket in hand. 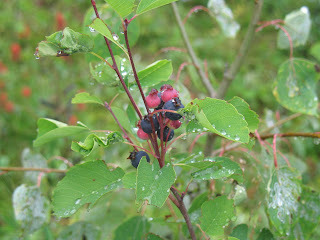 Wendy took her around their property and showed her that the wild blueberries are also ready. Now that G. knew what to look for we discovered a bounty of them on our property as well! 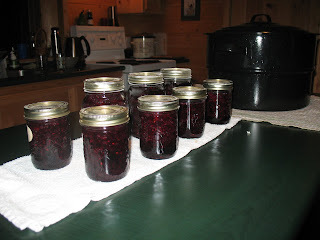 Last night we turned those lovely berries (or what was left of them anyways)and some huckleberries that we bought at the Farmer's Market, into these...yum! With the Horsefly Fall Fair coming up on August 23, we have been considering what we could enter. There are loads of categories from livestock to just about anything handmade. The children's categories are so wonderful! For the pre-school set for 10 cents you can enter any of the twenty categories from best decorated mudpie (8" or 9" plate using flowers, leaves, etc) to your favourite collection (of any type) to a children's story (as told to an adult). In the primary (5 to 8 yrs) class there are 25 categories and include baking, potted plants, a variety of arts and crafts, a lego construction (must be your own design) or a short story about "The Vegetable I Refuse to Eat" explaining your reason why. Now to the lagoon part, I know you have all been waiting for! 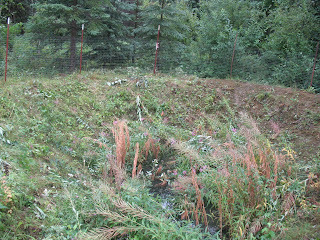 Wally let us borrow his gas powered weed whacker so we could clear some of the overgrowth around our septic lagoon. So Erich, got in there and mowed down some of the longer items...being very careful not to fall in! The lagoon needs to be kept clear of debris so the sun can get to it and the natural evaporation can occur. That's all I'll say...just be glad this is my post and not Erich's...he does love to talk septic. 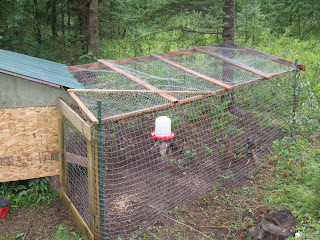 And our final project for the day...was to put a roof on the chicken yard to finally (I hope) foil their escape attempts. They have been completely free ranging for the last few weeks, which is fine except for three things...one they lay their eggs all over the property, so we have been having to buy our eggs from the gas station (they sell local organic eggs) and two, Farlee is no longer interested in chasing them off of our deck so we are getting tired of stepping over piles of chicken poop and three, they have taken a liking to Farlee's food...which is not good for Farlee and likely not great for the chickens either! I will still let them out for a gad about, likely in the afternoon, but it would be nice to know they are contained when I want them to be. Wow...it was a busy week-end! Hi Joanne, try elann.com for online knitting stuff, they are in BC and you can view prices in Canadian dollars. Good prices too.